The next thing we must coincide is the Pedals. Again there is no need to make things complicated. Pedals are the easiest part of the kart. They are nothing fancy, but if you wanted one could fashion them out of chrome plated 15mm O.D. tubing. But 10/8 mm steel rod WILL suffice. Again depending on how technical minded you are you may or may not bother to fashion brass bushing for each pedal. I done without them. Depending on where your seat is positioned you may want to adjust the position of the pedals along the shaft, or bring the entire pedal shaft closer towards you. 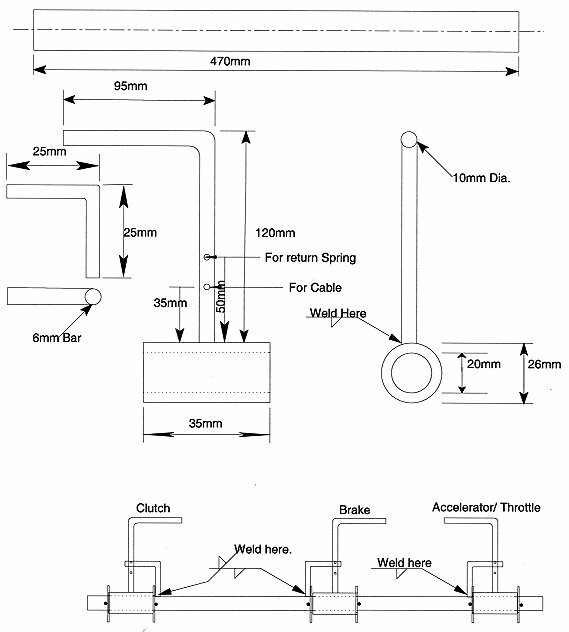 The Diagram is fairly easy to follow, it's just a matter of where to place the pedal shaft on the chassis. You can either Spot weld the shaft to the chassis or you can bolt it to the chassis. The spot can easily be ground of cut off with a hack saw. The pedals are held on the shaft by means of spit pins and washers, this allows easy removal for greasing etc. You can if you have access to a Lathe to make a better job of the Pedals, make bushings. If you are going to make Brass/Nylon bushings for the Pedals to pivot on, there are two measurements alterations to be taken into consideration. The Pipe that was going to spin on the pedal shaft, it's outside Diameter must be increased by 8mm, to allow room for the bushing to fit inside this small length of pipe. Having access to a lathe, you can make your own measurements to suit your materials etc. The bar bent into the L shape for the pedal, is to be welded to a bushing/pipe to spin freely on the pedal shaft. Remember you can't weld to brass!, You will have to make an outside metal jacket to weld the L shaped bar to, to make the pedals, if you want to use brass bushings. You will see that there are two holes drilled in the pedals. Keep these holes as small as possible, just the right diameter to suit the cable. The top one is for a return spring for the Pedal itself. The other end of the spring can be fixed to any stationary point on the chassis. The bottom hole is for the Cable. There are also small Pedal Stops to be made. These can easily be made out of light 6mm rod. They are basically made into the shape and measurements given on the Left middle of the diagram below. These will be easiest welded to the pedal shaft, by a small weld, which can be broken off with a bit of force if needed. At the very bottom of the diagram you can see the Layout of the pedals, the only unknown measurement is that of the positioning of the pedals along the pedal shaft, this will be determined by sitting into the Kart and to adjust them to suit individual requirements. As this stage is one of the last ones, the positioning of the pedals shouldn't be affected by anything else.